Aboriginal and Torres Strait Islander peoples have held the solutions to Australia’s climate extremes for tens of thousands of years, and translating this knowledge into action has never been more urgent for vulnerable communities facing rising seas. 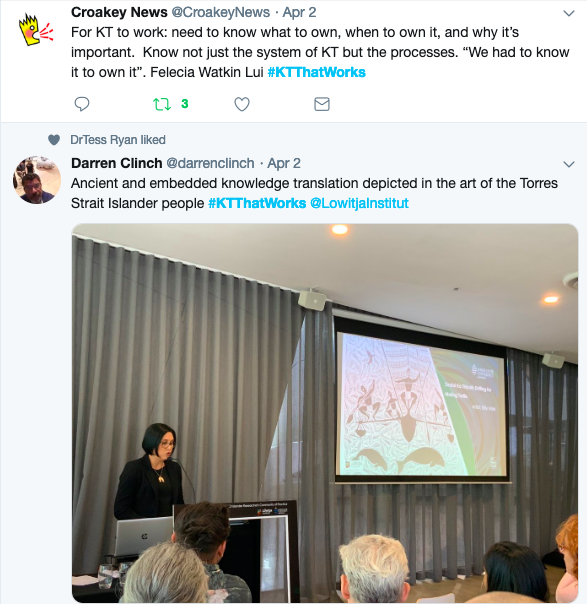 This was the message from an unprecedented collective of Torres Strait Islander researchers presenting their work to last week’s Lowitja Institute #KTthatWorks forum on innovative knowledge translation projects for Aboriginal and Torres Strait Islander health. 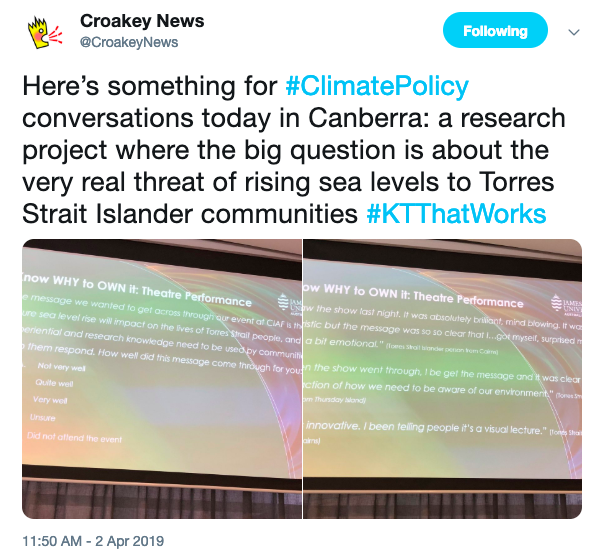 Croakey journalist Marie McInerney was there for the Croakey Conference Reporting Service and reports on a Torres Strait Islander community of practice breaking new ground on climate change. This is the second article in a three-part series arising from the forum. You can read the rest of our coverage here. Early last year children and other residents forced to flee their flooded homes on Yam Island in the Torres Strait took to the streets and social media holding up signs saying ‘Help Our Families’ and ‘Please Help Us’. Their communities, northeast of mainland Australia, are on the frontline of climate change but far removed from the politics and policies “down south”, says Torres Strait Islander academic and researcher Associate Professor Felecia Watkin Lui. 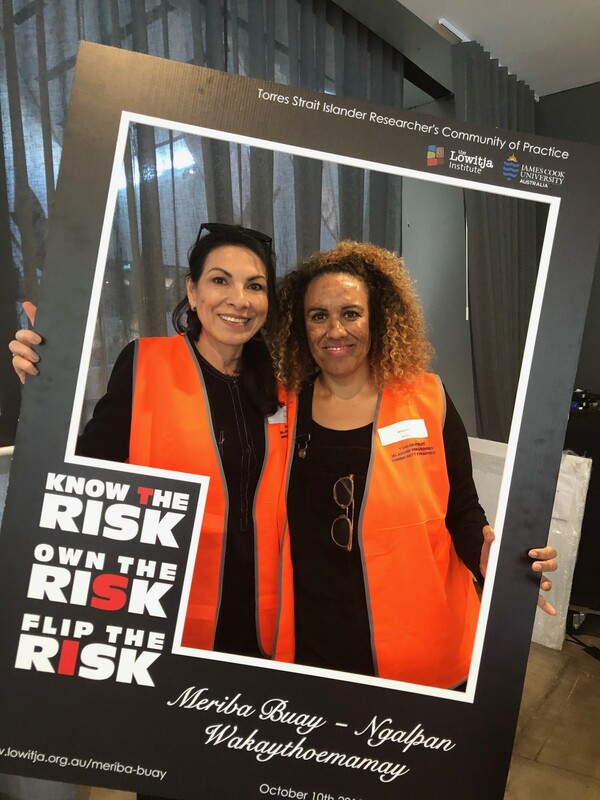 Watkin Lui is one of a group of Torres Strait Islander health researchers who have come together as a community of practice for the first time in a project known as Meriba buay – ngalpan wakaythoemamay (We come together to share our thinking). Their goal is to translate and harness both Western science and research, and local experiential (personal, traditional and cultural) knowledge, so that Torres Strait Islander people can develop their own solutions to the complex environmental and social problems on their doorsteps. It’s work that their people have done for centuries, but is urgently needed now to respond to a host of climate related crises, including rising sea levels, loss of homes and lands, depletion of fish stocks and pollution of the marine environment which is a key breeding ground for endangered species like the green turtle and dugong. “Our communities know climate change is very real and is impacting on their communities in a very real and dramatic way,” said Watkin Lui , a research assistant at the Indigenous Education and Research Centre at James Cook University in Cairns. “It’s flooding our houses, it may mean forced migration of our people, forced disconnection to our home islands for tens of thousands of us who live away…. We’re talking about something that impacts on us immediately and …on generations to come,” she said. 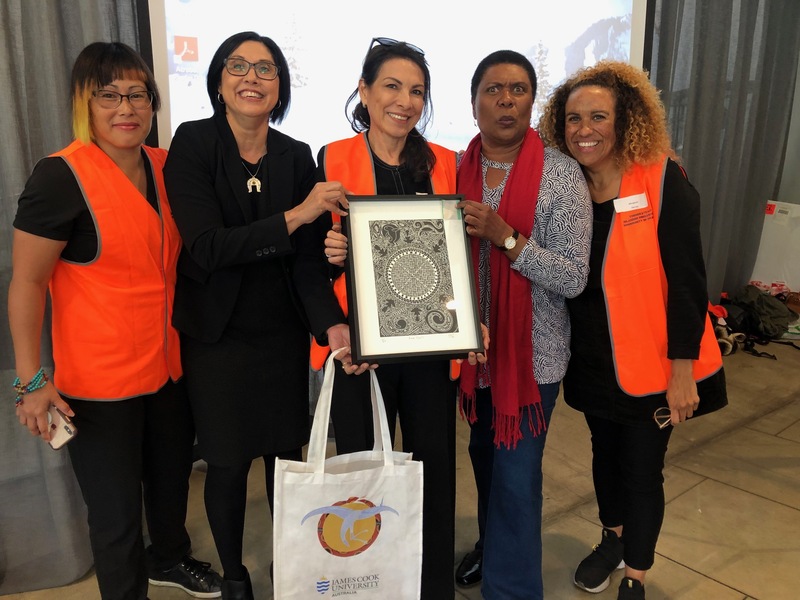 Watkin Lui and three fellow Torres Strait Islander researchers Dr Sanchia Schibasaki, Lynda Ah Mat and Margaret Harvey, presented on the work of Meriba buay – ngalpan wakaythoemamay at a forum hosted last week in Melbourne by the Lowitja Institute to showcase innovative examples of knowledge translation. 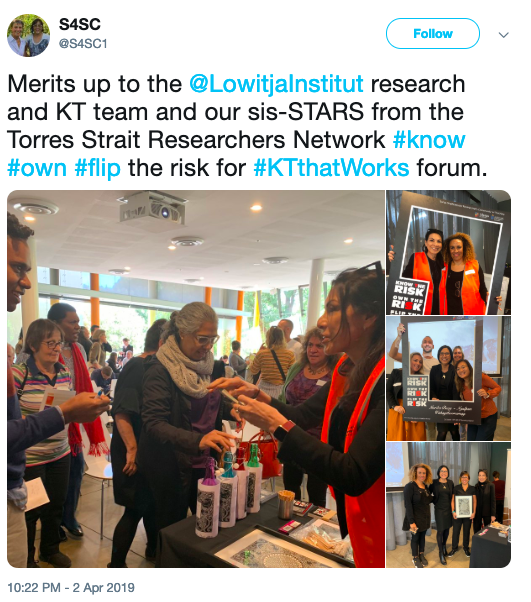 The project was conceived in May 2017, when Watkin Lui convened a Torres Strait Islander researcher workshop in Cairns to provide input into research agendas such as the National Health and Medical Research Council (NHMRC) Roadmap 3 and the review of the values and ethics guidelines for Aboriginal and Torres Strait Islander health research. 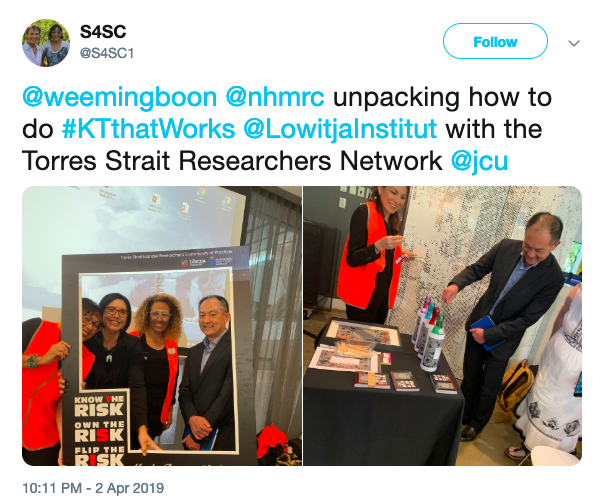 The workshop brought together — for the first time — 12 Torres Strait Islander researchers from the Torres Strait, Cairns, and Brisbane with expertise across multiple disciplines, plus representatives from the NHMRC and the community controlled Wuchopperen Health Service. This community of practice now has expertise across the domains of health, education, science, environment, engineering, technology, economics, social sciences, community development, knowledge translation, performing arts, visual and creative arts, management and administration, as well as traditional knowledge systems and practice. At that first meeting, the group identified concerns about the social determinants of health and wellbeing of Islander people in the Torres Strait and mainland, and a dearth of specific evidence that recognised and could support effective decision-making for Torres Strait Islander people as a discrete group among Indigenous Australians. Two things were evident to those present: a growing pool of early career Torres Strait Islander researchers with the collective expertise to lead research and knowledge translation for their communities, and that the urgent priority identified by these communities was rising seas. “We didn’t pick a project out of the hat,” said Ah Mat. The project has a simple but powerful mantra: “Know the risk, own the risk, flip the risk”. Knowing the risk involved not only an appreciation of the facts, but a framework for action, the researchers explained. Among the affected communities there was no question that climate change was a risk, but ‘knowing’ required more: agreement that it was an important social determinant of health for Torres Strait Islander communities; specific knowledge or expertise regarding this risk within the group; and action that was realistic in practical and financial terms. With political and policy conversations around carbon taxes and renewable energy taking place at a great distance both geographically and conceptually from the Torres Strait, owning the risk was an even greater challenge, they said. “It’s hard for people to own what’s happening on a policy level if they don’t identify with the range of strategies and solutions that seem so far from where they are, culturally and geographically,” explained Watkin Lui. 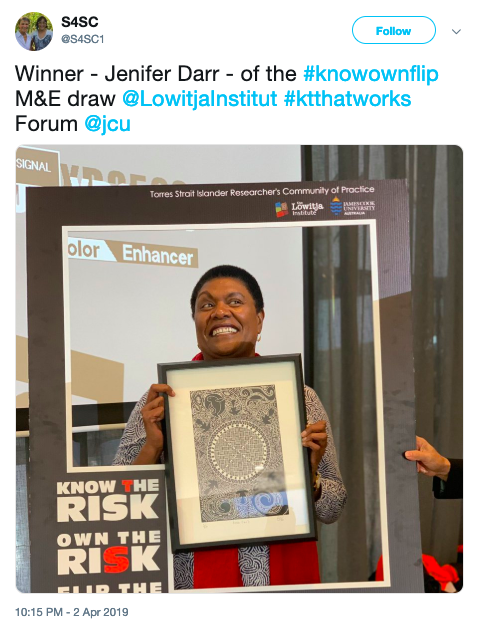 Recognising the power of the arts in their communities, the researchers targeted their first knowledge translation event at the opening night of the 2018 Cairns Indigenous Art Fair (CIAF), a high-profile event attended by politicians, Torres Strait community leaders and members. 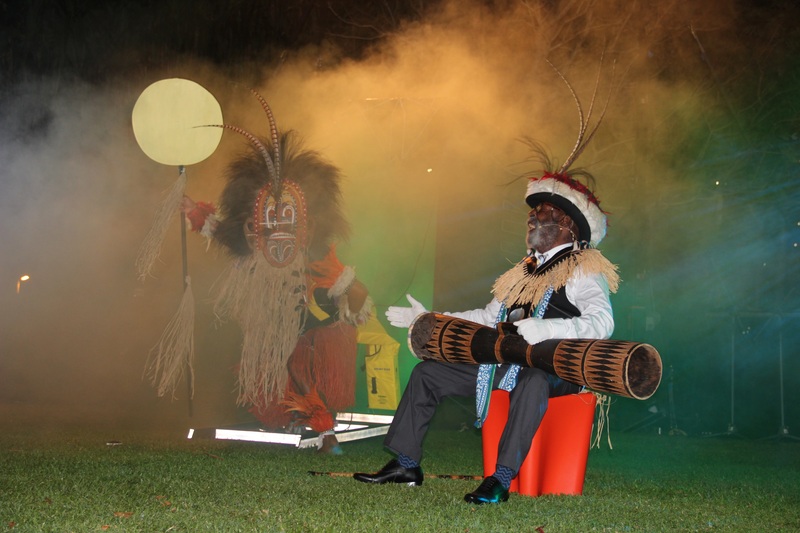 They produced a 15 minute multi-media performance piece titled Woer Wayepa—The Water is Rising that took place at the end of the night. Schibasaki told the forum the researchers knew they had to ‘walk to talk’ on knowledge translation, to ensure they could answer the question: ‘Did you achieve what you set out to achieve, and most importantly, how do you know?’. Presenting their work in Melbourne, the team rolled out all the “bells and whistles” used to date in their community consultation and evaluation. 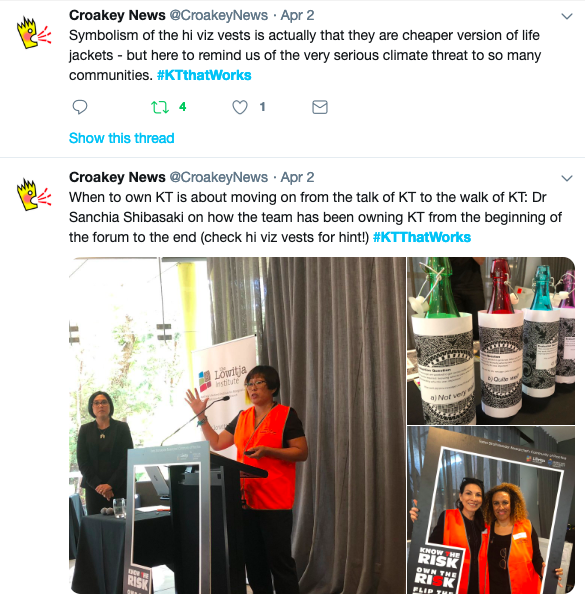 Wearing hi-viz vests (they can’t afford life jackets and Qantas won’t sell them their offcasts) to represent the threat of climate change, the team spruiked social media selfies and got people at the forum to ‘evaluate’ the impact of their presentation by popping popsicle sticks into bottles marked with various ratings. Similar methods were used at their community events — which included a ‘games night’ on the application of systems theory to complex problems — and the researchers said they had been encouraged by the response, winning an ARC grant to look at the application of their framework and building links to knowledge translation work in Canada. The final step — flipping the risk — involves developing tools, solutions and strategies to tap into and support the work being done by many other engaged people in the Torres Strait. It’s not easy work, and neither is securing the resources and approval for it to continue, with funding bodies and academic institutions making community engagement “very challenging and difficult”, said Watkin Lui. Doing research through a performance at an Indigenous arts fair and a games night “didn’t look like research, (it didn’t look) legitimate”, she added. 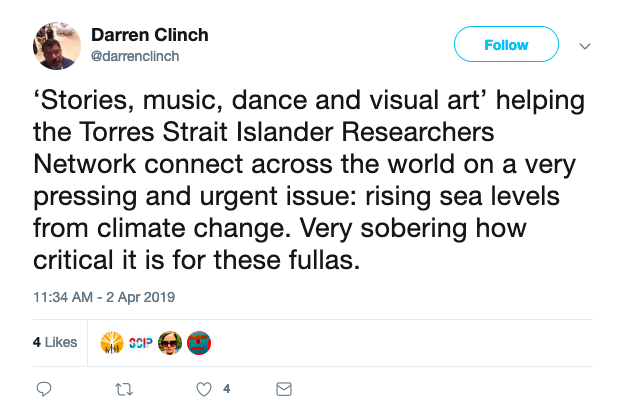 However, she said the Torres Strait Islander researchers aren’t seeking a sense of ‘legitimacy’ from mainstream institutions for knowledge systems and engagement approaches that are already valued in their communities. 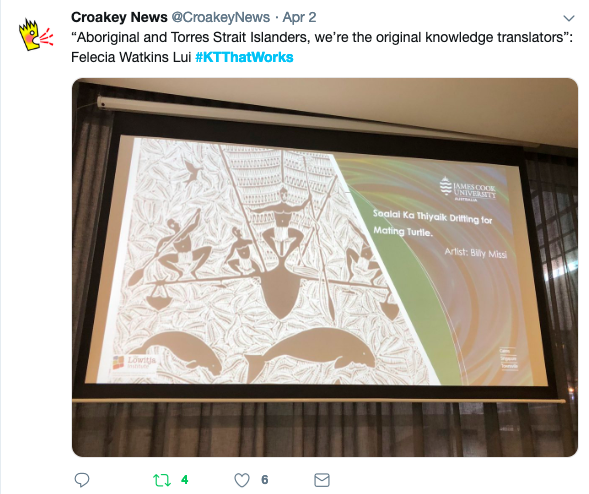 Instead, they hope the project will lead to more support “for the type of creative innovative spaces” that are familiar to Aboriginal and Torres Strait Islander people but yet to be recognised in mainstream institutional spaces. “The challenges are outside of these Indigenous led spaces, moving into other research areas, to say this is an important and significant way of doing research that is very beneficial to our communities,” said Watkin Lui. And the stakes are high for their work, as the researchers explain in the project video below. 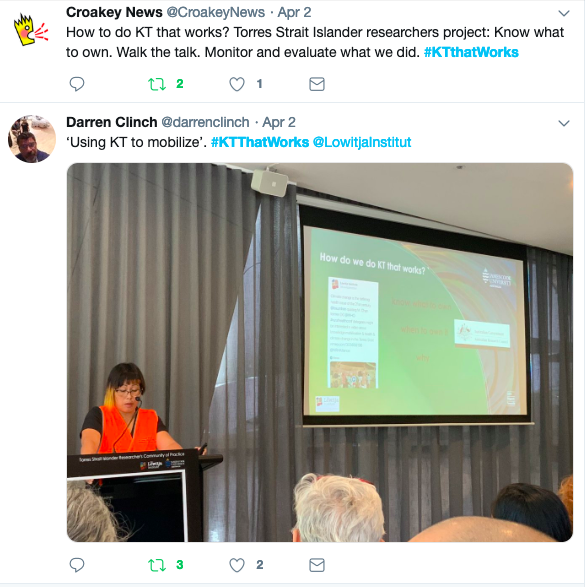 Our Croakey Conference Reporting Service archive of stories from #KTthatWorks can be found here.